The word Eczema comes from the Greek word 'ekzein' which means 'to boil'. Although most cases of the condition are not this severe, Eczema can often become not only highly uncomfortable and sometimes painful, but also somewhat embarrassing when on exposed areas such as the face and hands. Eczema is also known as dermatitis and is not at all contagious. Symptoms of mild eczema include; red, dry skin which is itchy and flaky. More severe cases can result in blistering, open oozing cracked skin and even bleeding, usually from persistent scratching. This obviously carries the risk of further infection. Eczema can affect people of all ages however, it is most commonly found in children and many children actually grow-out of the problem. The cause of Eczema is still largely unknown, although there are many theories as to why some people develop Eczema (a growing concern as more and more people seem to be developing the disorder). What is known is that eczema is an over-active response in the body's immune system but why this occurs is up for debate. Pollution, increased use of GM foods, stressful lifestyles? Although not classed as a hereditary condition, studies have shown the you are more likely to develop Eczema if there is already a history of the condition in your family. People who develop eczema are also very likely to have other immune system disorders like Asthma, Rhinitis, Sinusitis and food allergies. Himalayan crystal salt is far from your run-of-the-mill table condiment; In fact, this ancient salt contains over 64 minerals and trace minerals known to help nourish and repair our bodies down to a cellular level. One of the many benefits of this remarkable substance is its ability to help people suffering from Eczema. Salt therapy has been so effective in some cases that it completely heals the skin as well as preventing the eczema from reappearing. But how does it work? Applying 'sole(so-lay)' (Himalayan salt dissolved in water) to Eczema helps in a number of ways. 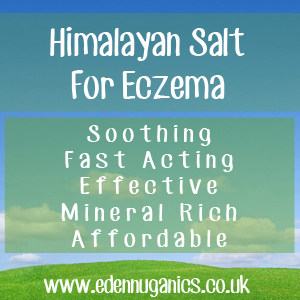 The minerals help to draw fluid from Eczema blisters through a hydrophilic action. It also helps to reduce and relieve the itching that is commonly associated with the condition. Himalayan salt therapy can also be beneficial due to its alkaline nature which helps to regulate the skin's pH levels. Sole is the name given to water when fully saturated with salt. This is then easily applied to the skin with the use of a mist spray or when added to a bath or soak. Take two or 3 large lumps of Himalayan crystal salt and add to a clean, empty glass jar. Next, fill the remaining space in the jar with distilled water. It is important to only use distilled water in the production of sole, as tap water will contain contaminants that may reduce its effectiveness. Once the jar is full, attach the lid and place in the fridge for 24 hours. After this time you should still see some large crystals of salt in the jar. This is good, if they have completely dissolved more salt crystals should be added. If kept in the fridge this mixture can be kept and used each day. It can be topped up as needed with extra salt and water. Coconut Oil - The powerful antimicrobial and moisturising properties of coconut oil make it perfect for treating Eczema. Simply slather on a generous amount and let it absorb into your skin. This will not only help to moisturise and repair your skin but also protect it from bacterial and fungal infection. Apple Cider Vinegar - Like the above mentioned coconut oil, ACV also possesses a wide array of antifungal, antibacterial and antiviral properties that make it another popular choice when it comes to home treatments for dermatitis. Simply add two cups to your bath water for a quick, easy and effective treatment.